With a wide variety of styles and typically larger bud sizes, a protea bouquet is a dynamic choice for situations that want a bold floral statement. According to the language of flowers, proteas symbolize diversity and courage. With over 1,400 cultivated varieties, there’s quite a bit of variance among members of the protea family. There are three dominant petal shapes – feathery spikes, leafy spades, and more stiff colored scallops. Buds come in a wide variety of colors, as well, with individual petals often showing color gradation. Overall, protea tends to be large enough to act as the focal point of an arrangement. Named by the famed botanist Carl Linnaeus in 1735 for Proteus, a Greek water god who could change it’s form at will, to allude to the dizzying array of shapes the plant comes in. Native to southern and eastern Africa, protea are among the only flowers who’s nectar was used as a sweetener. The Boers of South Africa called sweeteners made from protea nectar bossiestroop, which was more-or-less rainwater and plant nectar drained from the flower into a bucket, cooked down into a syrup, and used to sweeten tea. 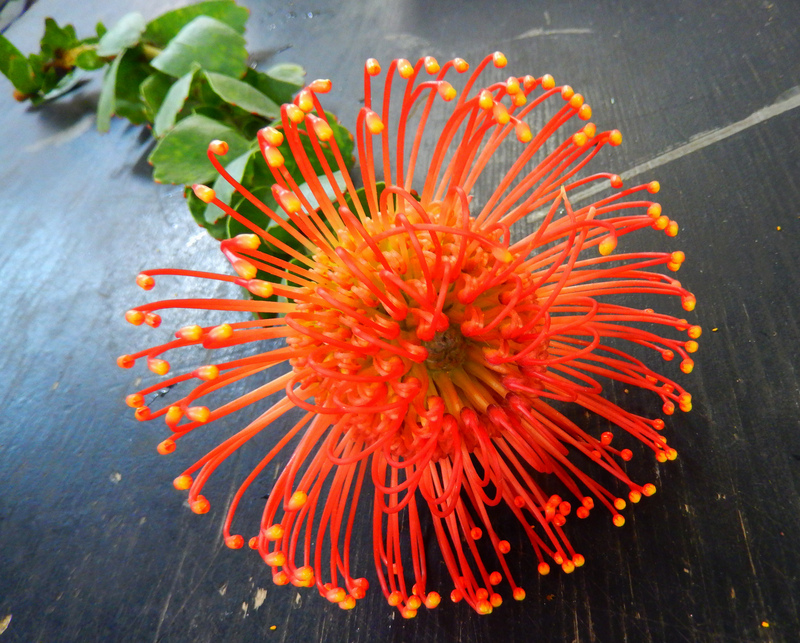 Pincushion protea are an especially interesting plant – the long spiky petals have enough structure that they are able to serve as creative placecard holders or picture frames. Next Next post: What’s up with the Aalsmeer Flower Auction?